Are you talking enough to everyone on site about health & safety? Do you make sure everyone is fully aware of the hazards on site each day? What about when a new piece of kit arrives on site? Or when you reach a particularly hazardous stage in the build? Do you explain what measures are being put in place to ensure everyone’s safety? Do you check that everyone understands their role in ensuring their safety and everyone around them? Do they know what to do to avoid accidents? Most importantly, are you keeping health and safety at the front of everyone’s minds? If you can say yes, and are already giving your team safety briefings, that’s great. If you’re not then you need to start now. And rather than having to talk off the top of your head, or search the internet for relevant documents, we’re pleased to say that the new Health & Safety Xpert 2018 edition will come with over 60 valuable Toolbox Talk documents, recommended by our NEBOSH accredited Health & Safety Consultant, in line with what CITB and the HSE encourage. Alongside the Toolbox Talks Health & Safety Xpert has all the documents to keep you in line with the latest regulations and CDM 2015 compliant: Risk and COSHH Assessments, Company Health & Safety Policy, Method Statements, Pre-Construction Info, Construction Phase Health & Safety Plans, Health & Safety File, Site Inspections and more, including 35+ Management documents! Take a look at our Health & Safety Xpert gallery to see a range of sample reports. Essentially, each ‘toolbox talk’ is a short presentation to the workforce on a single aspect of health and safety, and takes place before a specific task is going to be carried out. Each one is designed to heighten awareness. And even if there isn’t anything out of the ordinary happening that day you should still use one or more of the Toolbox Talks on a daily basis to promote a culture of health and safety, to prompt a discussion between you all, run through emergency procedures, explore the risks and think about ways of dealing with them. Of course they don’t replace health and safety training, but they’re a good reminder and effectively there to reinforce what your workforce should know already. 10-15 minutes well spent. How do you use a Toolbox Talk? Simply print the document off (it’s probably worth have a read through beforehand). Choose a quiet spot on site where there aren’t any distractions so that everyone can concentrate for those few minutes. Read it out to everyone. Open it up for discussion, encourage questions – however basic they might be. Make a note of the date of the talk, the subject and who was in attendance. It’s good protocol and proof if needed for the HSE. 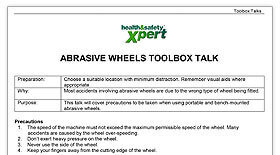 Please note, Health & Safety Xpert provides a Toolbox Talks Register for recording who’s received what talk. Make the Toolbox Talk part of the daily routine, and alongside the briefing, you could take the opportunity with everyone gathered round, to run through any housekeeping matters or issues with the job, be they material hold-ups, or changes to the plans. How does Health & Safety Xpert help? Anyone familiar with the Health & Safety Xpert software will know that it automatically identifies the risks a particular project faces. And now, as well as helping your business comply with CDM 2015, singling out all the risk and COSHH assessments, method statements and policiesassociated with the project, software users will also now be given the relevant Toolbox talk documents to read out to the workforce at the appropriate points in the job. To see where the Toolbox Talks sit within the process of managing health and safety, as per the HSE’s ‘Managing for Health & Safety’ (HSG65) document, take a look at our guide. This useful pdf file matches the documents with the four stages within HSG65, ‘Plan, Do, Check, Act’. Anything you don’t understand, just talk to one of our team. Are Toolbox Talks required by law? As an employer you have a legal duty of care to everyone on site to make sure they are working safely without any risk to their health. It’s important to give them the right information and the right instructions to ensure they’re sufficiently competent to carry out the work. What other actions should you be taking? SUPERVISING This is particularly important if your workforce includes young workers, inexperienced people and anyone new to the site. You need to consider the level of supervision appropriate to the individual. LEADING BY EXAMPLE! Of course you have to practice what you preach. Violating the rules yourself isn’t going to help you get the workforce on side. 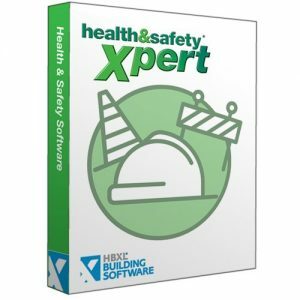 Health & Safety Xpert is your go-to software for all things safety related. The software is regularly checked, and any new legislation is quickly added – what builder has got time to do that themselves? And with more builders, contractors and trade sub-contractors using Health & Safety than any other health & safety software, you know you’re in safe hands. If you have the software already, then make sure your Support & Updates is valid, in order to get your software updated to Health & Safety Xpert 2018 60+ Toolbox Talk documents . And if you’re yet to buy the software, can we point you in the direction of a free test drive, or may be straight to the shop! It’s great value and can be learnt in a matter of minutes. Or give us a call on 0117 916 7898. Let’s talk!